[Update: I just read a good piece about the bicycle riding opportunities at Mount Rainier National Park at the Washington Bikes blog — Biking at Mount Rainier. 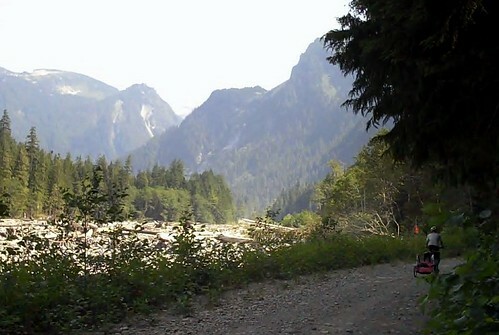 Here’s a bike trip a friend and I took about four years ago from Bellevue to the Isput Campground at the national park, which included a 5-mile ride inside the park on Carbon River Road, which had recently been closed to motor vehicle traffic at the time we did this. 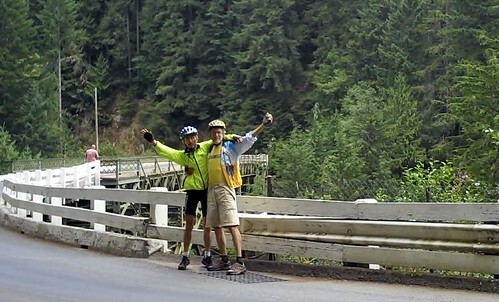 Aug. 8- 2010 — My bicycling buddy Kazuki and I are shown celebrating the exhilarating experience of crossing the bridge over the deep Carbon River gorge on the way to Mount Rainier National Park this week. This is one of the amazing landmarks we came upon on our bicycle ride from our Bellevue, Washington, neighborhood to our destination in the national park. 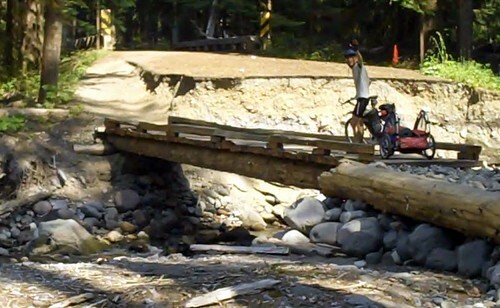 We had loaded up our mountain bikes and trailers and departed Thursday for a ride to the Ipsut Creek Campground. After spending the first night camping at the Kanaskat-Palmer State Park, our night spent in the wilderness campground inside the national park was completely different. 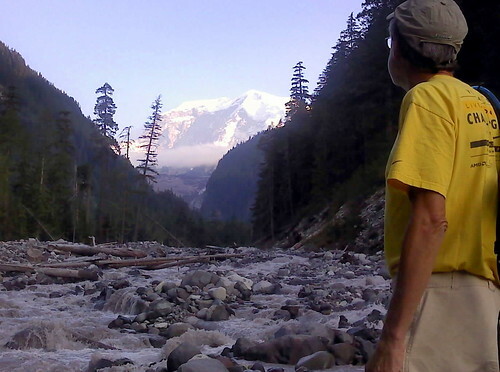 The 5-mile road from the Carbon River Ranger Station to the Ipsut Creek Campground was opened about 1921 and runs right along the meandering drainage of the Carbon Glacier of Mount Rainier. After particularly devastating floods in November 2006, the national park service decided it was time to stop wasting money and resources by constantly repairing the road and closed it to motor vehicle traffic. The result is wide hiking and bicycling path along the river with occasional circuitous, narrow detours around washouts and treefalls. And the Ipsut Creek Campground is like a scene from “The Time After Cars.” This is unlike any wilderness campground I’ve ever visited. The day-use parking lots are still there, there are picnic tables and fire rings at all the sites and gravel parking spaces and log curbs at each campsite for a car or small motorhome to pull into. The difference is that no cars are allowed, and the roads and spaces are all getting buried in the accumulation of pine cones, needles, branches and limbs that fall from the forest canopy. Needless to say, there are no barking dogs, humming generators or riffs of AC-DC wafting through the trees. Although more than a dozen tents sprouted among the trees, all we could hear was the roar of the Carbon River and the rumblings of boulders bumping downstream. After dinner, we took a 1.7-mile hike up the Carbon River trail to the Lower Crossing, where log bridges directed us into the middle of the rock-filled river bed with a clear view up the river to the Carbon Glacier on Mount Rainier. It’s an awesome experience to witness such spectacular mountain scenery just a two-day bike ride from home. I’m grateful for my health and sense of adventure that brought me to this spot. I’ll have to thank Kent Peterson for giving me the idea for this route. He wrote at Kent’s Bike blog about his bike ride down to the Ipsut Campground last winter while he was training for the Tour Divide. The route we mapped out wasn’t the most direct, as it included lots of bicycling along rail-trail routes. The total bike tour was about 150 miles. 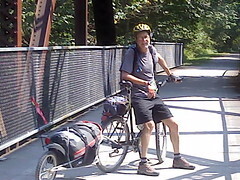 The first day, Kazuki and I left Bellevue and headed south to the Cedar River Trail, which we followed to the end in Landsburg. From there we headed south to Black Diamond and the famous Black Diamond Bakery were we stoked up on chocolate brownies that boasted more icing than cake. We took an indirect route to the Kanaskat Palmer State Park campground so we could cross the scenic Green River Gorge. Apparently there are quite a few private campgrounds in this area as we saw camper vehicles back in the woods here. We had reserved a spot here; we later suggested they open a hike-bike spot at the park. Distance from home was 45 miles (includes a 5-mile detour due to getting directions from someone who doesn’t know their own backyard). State park campground experience was uneventful, and we awoke to heavy mist and some sprinkles the next morning. 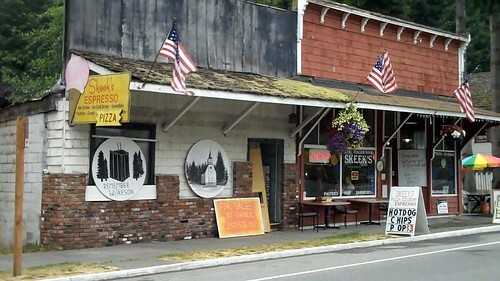 We continued our southern route through Enumclaw, where we stopped at Aaron Brenner’s Bakery (it began clearing up by the time we left), Buckley and Wilkeson. We stopped at Skeek’s sandwich shop in this old coal mining and stone quarrying community and caught up on local history and recent news. It was all uphill after Wilkeson. An amazing sight was the one-lane Fairfax Bridge over the narrow Carbon River gorge. Soaring 250 feet above the river, it was the tallest structure in the state when it was built in 1921. The road rose steadily to the Carbon River Ranger Station at 1,700 feet, with the roaring river within earshot the whole way. We got our wilderness permit and took off into the forest on the abandoned road. We reached the campground about 38 miles after leaving Kanaskat; that includes 5 miles on the abandoned road. We awoke to a heavy fog covering the wide river channel, but it was already burning off by the time we broke camp. Our route home back-tracked through Wilkeson (and a second breakfast at Skeeks), but then we turned west toward Orting so we could pick up another rail-trail — the Foothills Trail. This paved trail starts in South Prairie and continues all the way to the outskirts of Puyallup. It passes through Orting, familiar to cyclists in the Daffodil Days Classic. We spent the next hour picking our way from the end of the Foothills Trail to the beginning of the Interurban Trail up the road in Pacific. I’m always surprised how few communities can work together to designate bike routes that link separate bike trails. I’ll have to ride this three or four more times before I find a decent route. It was raining by the time we got on the straight-shot Interurban Trail, so the final miles of our trip were spent cranking along to get home as soon as possible. The indirect route home totaled 73 miles. 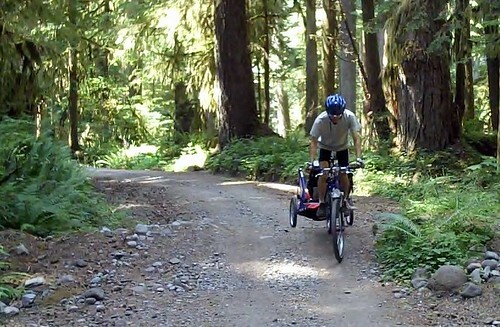 Would you recommend pulling a bike trailer along the Carbon River Road trail to Ipsut Creek CG? A ranger on the phone told me it was “ok” (maybe “sure”), but your Vimeo video makes it look dicey. I was also wondering how the cars got to the CG at the end of your video. I thought you could no longer drive there. “OK” sounds about right. I used a one-wheeled trailer and my friend used a two-wheeled trailer. I lost momentum in one spot and dumped my rig. Shoulda walked it like my buddy. 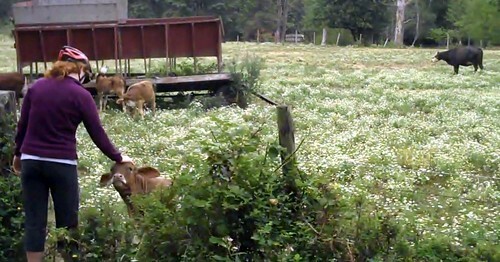 I returned a couple of years ago and the former road has been getting a little wilder in places. Some big fallen trees haven’t been removed, and the path is built up so riders cross over them. Elsewhere, large pebbles from the nearby riverbed are used as trail surface. Based on that, I’d say a trailer is still “OK”, but expect to walk your bike through a few rough sections. That isn’t my video, but it you read the caption at 45 seconds, it says the it’s a video from the Isput Creek Campground to the entrance. So the cars you see are parked at the ranger station trailhead.